This Can Only Be Accomplished Through Socialism! Like a skyscraper crane about to topple in high winds, Venezuela is teetering on the brink of a horrific economic collapse. It was brought on by one thing: socialism, taken to the hilt. Yet incredibly, neither Bernie Sanders nor his voters make this connection. Today Venezuela, with the world’s largest oil reserves is, believe it or not, importing oil. It’s a perfect illustration of Nobel-winning economist Milton Friedman’s well known saying that if the Sahara took up socialism, there would soon be a shortage of sand. 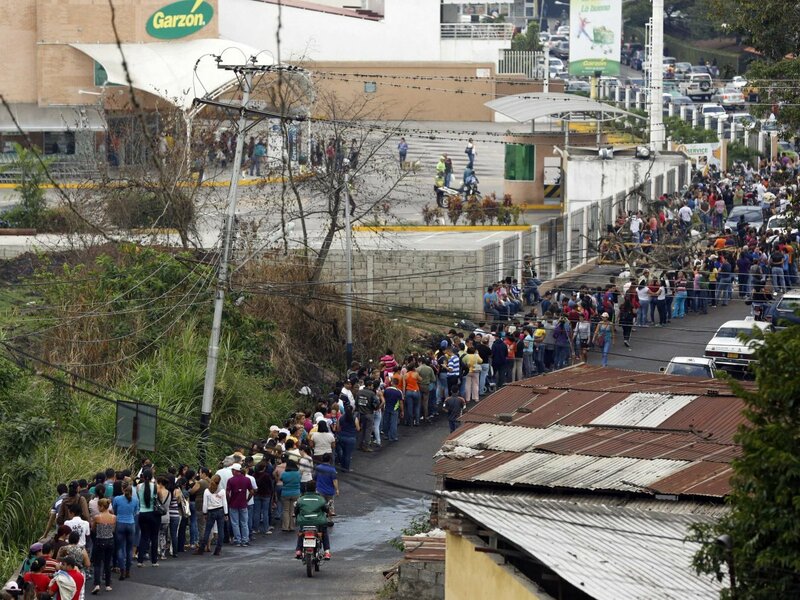 Socialism has also led to massive shortages of food, toilet paper, diapers and medicine, among many other things, all the result of state planning and currency controls and rampant inflation (see photo above of Venezuelans lining up for food). After 18 years of socialist spending, inflation has hit 720%, the IMF says. And don’t forget that Venezuela also has the world’s highest crime rate, with Caracas rated the world’s most dangerous city by the Citizens’ Council for Public Security and Criminal Justice. The economic crisis in Venezuela has exploded into a public health emergency, claiming the lives of untold numbers of Venezuelans. It is just part of a larger unraveling here that has become so severe it has prompted President Nicolás Maduro to impose a state of emergency and has raised fears of a government collapse. Hospital wards have become crucibles where the forces tearing Venezuela apart have converged. Gloves and soap have vanished from some hospitals. Often, cancer medicines are found only on the black market. There is so little electricity that the government works only two days a week to save what energy is left. Socialism is a mental poison that leads to human misery of the sort you see in the wrenching pictures [that appeared in the Sunday New York Times article above] of filthy operating rooms, broken incubators and desperate patients lying in pools of blood, dying for lack of such basics as antibiotics. Democratic socialism—whether Chavez’s or Sanders’s—is legalized theft in the name of the people against the vilified few. It is a battle against income inequality by means of collective immiseration. It is the subjugation of private enterprise and personal autonomy to government power. Over the past decade, an estimated 13,000 physicians fled the country in search of greener pastures. Cuba dispatched some of its own physicians to fill the gap, only to see them defect in turn. That’s no shock, considering that the physician father of a Venezuelan friend of mine has been reduced to accepting payment in cooking oil and other groceries. 7. As Bloomberg reported recently, Venezuela doesn’t even have enough money now to pay for the paper to print more money to keep up with its hyperinflation (which will reach 720% this year according to the IMF). 8. Looting of grocery stores has become increasingly common in Venezuela, as a result of the food shortages, watch video here. 9. In the CNN video below “Food, medicine scarce as Venezuela crisis deepens,” we learn that even though Venezuela is sitting on the world’s largest oil reserves, it can’t stock the nation’s refrigerators and can’t provide the life-saving medicine that many Venezuelans need to survive. This crisis has exposed the hollow promise of the socialist policies Mr. Maduro and his predecessor, Hugo Chávez, have peddled since the late 1990s. While many Venezuelans got a taste of prosperity in better housing, subsidized food and higher wages when oil prices were high — oil accounts for roughly 96 percent of Venezuela’s exports — the government failed to build anything resembling a sustainable economy. It also failed to save when money was flowing in, which would have softened the impact of the recession that began in 2014. The New York Times also points out that Venezuela’s apocalyptic murder rate is now about 52.2 Venezuelans per day, or one murder about every 28 minutes.